We present a study of the mechanical power generated by both winds and jets across the black hole mass scale. We begin with the study of ionized X-ray winds and present a uniform analysis using Chandra grating spectra. The high-quality grating spectra facilitate the characterization of the outflow velocity, ionization, and column density of the absorbing gas. We find that the kinetic power of the winds, derived from these observed quantities, scales with increasing bolometric luminosity as log (L wind, 42/Cv ) = (1.58 ± 0.07)log (L Bol, 42) – (3.19 ± 0.19). This suggests that supermassive black holes may be more efficient than stellar-mass black holes in launching winds, per unit filling factor, Cv . If the black hole binary (BHB) and active galactic nucleus (AGN) samples are fit individually, the slopes flatten to αBHB= 0.91 ± 0.31 and αAGN = 0.63 ± 0.30 (formally consistent within errors). The broad fit and individual fits both characterize the data fairly well, and the possibility of common slopes may point to common driving mechanisms across the mass scale. For comparison, we examine jet production, estimating jet power based on the energy required to inflate local bubbles. 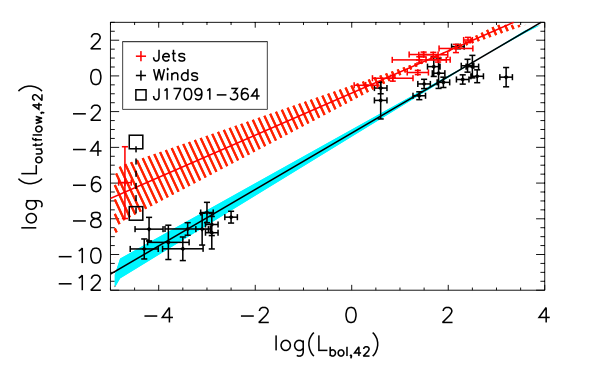 The jet relation is log (L Jet, 42) = (1.18 ± 0.24)log (L Bondi, 42) – (0.96 ± 0.43). The energetics of the bubble associated with Cygnus X-1 are particularly difficult to determine, and the bubble could be a background supernova remnant. If we exclude Cygnus X-1 from our fits, then the jets follow a relation consistent with the winds, but with a higher intercept, log (L Jet, 42) = (1.34 ± 0.50)log (L Bondi, 42) – (0.80 ± 0.82). The formal consistency in the wind and jet scaling relations, when assuming that L Bol and L Bondi are both proxies for mass accretion rate, suggests that a common launching mechanism may drive both flows; magnetic processes, such as magnetohydrodynamics and magnetocentrifugal forces, are viable possibilities. We also examine winds that are moving at especially high velocities, v > 0.01c. These ultra-fast outflows tend to resemble the jets more than the winds in terms of outflow power, indicating that we may be observing a regime in which winds become jets. A transition at approximately L Bol ≈ 10-2 L Edd is apparent when outflow power is plotted versus Eddington fraction. At low Eddington fractions, the jet power is dominant, and at high Eddington fractions, the wind power is dominant. This study allows for the total power from black hole accretion, both mechanical and radiative, to be characterized in a simple manner and suggests possible connections between winds and jets. X-ray wind data and jet cavity data will enable stronger tests.